The Supreme Court has its calendar set through January 2018 with ten cases already accepted for argument that are as of yet unscheduled. The total number of case grants so far is 53, and with consolidated cases this will lead to 47 arguments. This puts the Court on pace for one of the slowest grant rates in recent history. Petitions have not dropped in number though. With upwards of 8,000 petitions filed each year, this creates an atmosphere of increasingly fierce competition for the justices’ time. Since several attorneys have more than one case granted for argument during the current term, fewer than 50 attorneys of record currently have arguments slated for Supreme Court oral argument. This post looks at those attorneys. It examines who has filed successful petitions for the current term. It also tracks these attorneys’ success at bringing cases to the Court on cert since the 2013 term. Many of these attorneys are regulars before the Court; members of the colloquially dubbed Supreme Court Bar of elite attorneys. So far this term, three attorneys were both counsel of record on at least one successful Supreme Court cert petition and and listed as an attorney on three granted petitions. These attorneys are Jeffrey Fisher and Pamela Karlan from the Stanford Supreme Court Litigation Clinic and Williams & Connolly’s Kannon Shanmugam. Shanmugam was the only attorney acting as counsel of record on all three petitions, in: Digital Realty Trust, Inc. v. Somers, Dahda v. United States of America, and Ernst & Young LLP v. Morris. For the professors from the Stanford Supreme Court Litigation Clinic Jeffrey Fisher was listed as counsel of record in Currier v. Commonwealth of Virginia and Jesner v. Arab Bank, PLC, while Pamela Karlan was listed as counsel of record in Lozman v. The City of Riviera Beach, Florida. Looking at all successful petitions not including those emanating from the federal government, the following graph shows the counsel of record for all petitions granted this term and the number of cert petitions these attorneys have filed since the beginning of the 2013 Supreme Court term. Paul Clement has participated in almost double the number of filings as the next attorney on the list, Jeffrey Fisher. Many of Clement’s petitions which were later denied were filed on behalf of R.J. Reynolds Tobacco. Other attorneys not already mentioned with 20 or more petitions filed since the 2013 term include Hogan Lovells’ Neal Katyal, UCLA Supreme Court Clinic’s Stuart Banner, and Alliance Defending Freedom’s David Cortman. The number of petitions filed provides a sense of how active these attorneys are before the Supreme Court. As one of the most prolific attorneys before the Supreme Court, Paul Clement logically fits into the role of most active filer with an active granted petition. 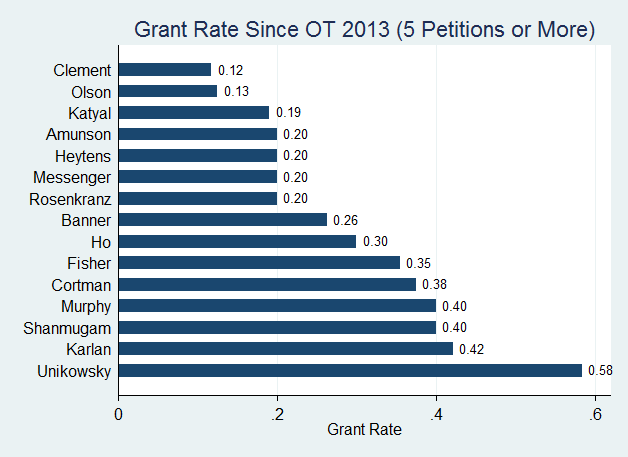 The number of filed petitions gives us a sense of activity, but the number of grants actually begins to tell us how these attorneys have fared on cert over the past several years. 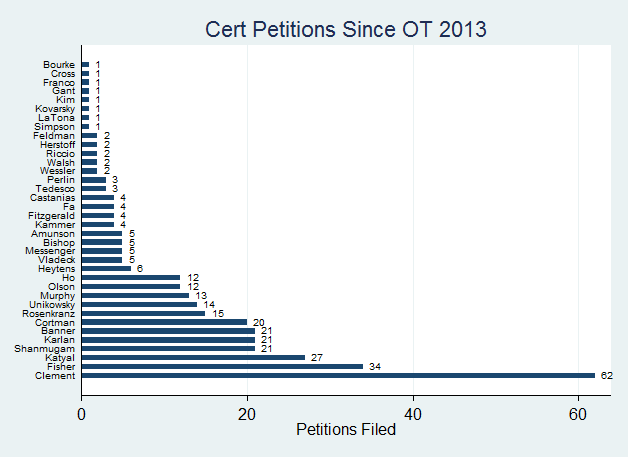 The graph below charts the number of granted petitions these attorneys (those with at least one granted petition this term) were listed on since the beginning of the 2013 term. This graph only covers attorneys within this group that filed at least five petitions since the 2013 term and does not count cases that were granted, vacated, and remanded or GVRed. Jeffrey Fisher who is often noted for his cert success (see for example on page 27 of this paper). The other attorneys with current grants and five or more granted petitions since 2013 were all discussed above aside from Jenner & Block’s Adam Unikowsky. 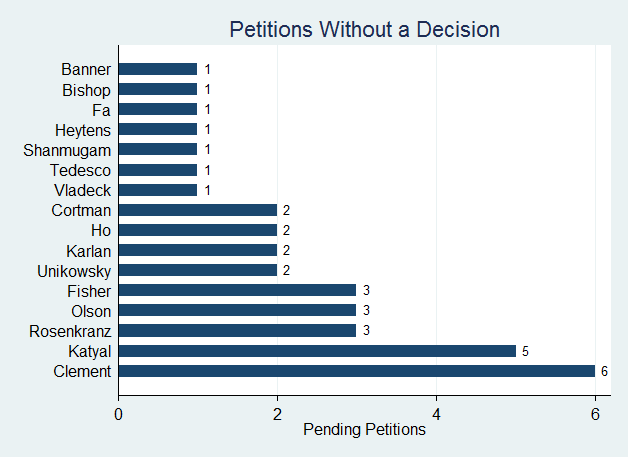 Unikowsky’s role in this process should not be understated though as is apparent from the next graph that looks at the successful petition rate for the attorneys listed in the previous graph. 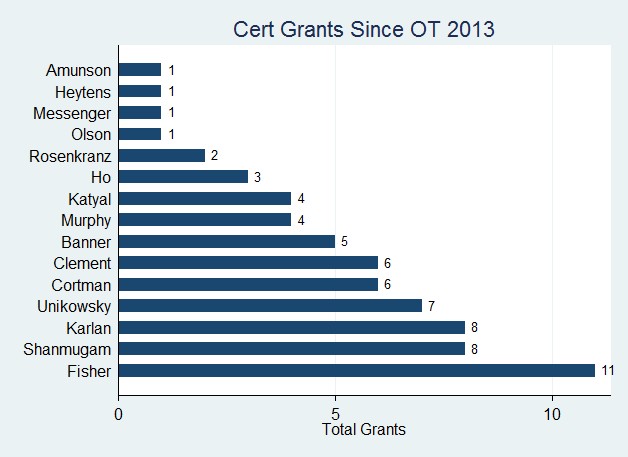 With seven grants out of a total of twelve petitions, Unikowsky’s 58% cert success rate since the 2013 term tops the list for these attorneys. After Unikowsky come Pamela Karlan, Kannon Shanmugam, and Ohio’s Solicitor General – Eric Murphy. Murphy saw four of his ten petitions since the 2013 term granted by the justices. After David Cortman and Jeffrey Fisher, Morgan Lewis’ Allyson Ho has a 30% grant rate for this period on three grants out of ten petitions filed. As several of these attorneys have multiple petitions currently in the pipeline, we may see additional grants for one or more of these attorneys before the Court fills its calendar for the remainder of the term. The group of attorneys covered in the post presents a picture of some of the most successful attorneys that currently practice before the Court. Some of these attorneys including Paul Clement, Neal Katyal, Josh Rosenkranz, and Ted Olson are veterans in this business. Several younger attorneys including Kannon Shanmugam, Adam Unikowsky, and Allyson Ho are currently rising to the top of the ranks of Supreme Court practice. Finally the two Supreme Court litigation clinics that were both mentioned above, UCLA’s and Stanford’s, are proving to be two of the most successful programs in terms of bringing cases to the Court in recent years. Note: There are instances with multiple successful petitions for the same attorney in the same case. In these instances when multiple petitions were joined in one case, I counted the number of granted petitions as one. Previous Post Is a Recipe for Justice Kennedy a Recipe for Success? Pingback: How Does a Case Get to the Supreme Court?